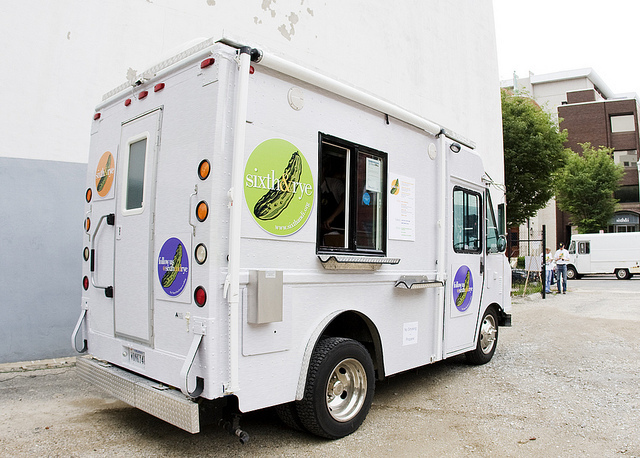 Article first published as The Food Truck That Drove Right Over Kosher Politics on Technorati. Kosher certification in the nation’s capital has become much like everything else in D.C. – political and divisive. The Vaad Harabanim of Greater Washington has long had a monopoly on kosher certification and it doesn’t want to give up its stronghold anytime soon. These tactics, which seem to violate the Sherman Anti-Trust Act, have come to light as a result of the local D.C. Vaad refusing to grant a kosher certificate to Sixth and Rye, the new food truck run by the Sixth and I Historic Synagogue. Last year, the non-denominational congregation offered an iPad as a prize to the individual who came up with the synagogue’s next big idea. The winning submission was a kosher deli restaurant housed in a truck to jump on the country’s trend of food trucks that roll out at certain times as announced via a Twitter feed. The main reason the synagogue leaders launched the Sixth and Rye food truck wasn’t because they thought D.C. needed another kosher restaurant (though it does), but rather to increase its out-of-the-building engagement with local Jews in the District. The plan was to run the food truck at lunch each Friday afternoon. Everything seemed to be in place after they found a truck to rent, arranged for it to be made strictly kosher, purchased the signage, and contracted with celeb “Top Chef” contestant Spike Mendelsohn. The only thing that kept Sixth and Rye from opening as planned was the local Vaad’s refusal to certify the truck. The popular synagogue, which functions more like a Jewish center with no membership, only had the best of intentions. In creating Sixth and Rye, they were planning to reach out to young Jews and provide a delicious, kosher deli lunch to workers in downtown Washington. The Vaad, in refusing to certify the food truck as kosher, missed a great opportunity. Thankfully, along came a rabbi from Baltimore who agreed to give Sixth and Rye his hekhsher (kosher seal of approval). Rabbi Y. Zvi Weiss, the Baltimore kosher certifier, essentially broke the Vaad’s monopoly when he gave the food truck his okay. Hopefully, this will demonstrate to Washington’s kosher observant community that alternative options to the Vaad exist. With more than one kosher certifying agency in our nation’s capital there will be more kosher restaurants and a price decrease on kosher food. The Washington Post article about Sixth and Rye painted a clear picture of the misperceptions in the kosher marketplace. It reported that a young Washington local called the Vaad Harabanim of Greater Washington and was told that they were not certifying the truck, sohe didn’t bother getting in line to order his deli lunch. If the Vaad doesn’t certify it, he was certain it couldn’t be kosher. Alternatively, he could have inquired about the food truck’s certification and then learned from Baltimore’s Rabbi Weiss about his supervision and standards thereby making an informed decision. Unfortunately, the local Vaad in D.C. (and in many other communities around the country) has convinced people that only they have the power to pronounce what is kosher. This only leads to ignorance and knee jerk reactions. When I spoke to Esther Safran Foer, the director of Sixth and I, she told me that another Orthodox rabbi in town sent a letter of support to her. Not only that, but he promoted the kosher food truck on his Facebook page and then bought over a dozen sandwiches for the Torah class he teaches on Capitol Hill. Kudos to Sixth and I Historic Synagogue for putting this innovative idea in motion. In addition to the convenience of kosher deli lunches once a week in downtown Washington, perhaps this food truck will jumpstart a national conversation to curtail the political nature of kosher certification. While these local Orthodox kosher certification agencies may enjoy their monopoly, some competition will be best for the consumers. Wouldn’t it be wonderful if in the future the only thing Sixth and I had to worry about with their food truck was whether they had enough challah on hand to serve the hundreds in line? Thank you very much for bringing “Sixth and Rye” to our community. What an amazing thing you are doing by introducing a Glatt kosher food truck to the District of Columbia. This will increase the number of people in the District who are eating Kosher food as well as making food easily accessible for those who are already eating kosher food. This is a great mitzvah and our community is grateful to you for this. Sixth and Rye adheres to the highest level of Kosher standards. It is under the rabbinic supervision of Rabbi Y. Zvi Weiss of Baltimore, a rabbi well known for his great reputation, both in scholarship and in piety. Additionally, under Rabbi Weiss’ direction there will be a rabbi supervising Sixth and Rye at all times. In truth, no matter how good a Kashrut supervision is, at the end of the day, it comes down to how trustworthy the proprietor is. In this case, I can think of no operation more trustworthy then you and your staff. I look forward to being a frequent customer of Sixth and Rye for many years. That kosher certification regimes can operate as local monopolies is something that should be getting more attention. A Vaad operating as the only kosher certifier in a local area can create strong disincentives for would-be kosher purveyors to enter the local market and can cause pricing for local kosher food to be prohibitively expensive. These effects, in turn, discourage observance of kashrut. In Phoenix, for example, the Jewish community is hugely underserved by only a small handful of kosher restaurants. Two Jewish restauranteurs (one with a vegan Asian restaurant, one hoping to open a Mediterranean bistro) have separately expressed their frustration at being forced into a choice between having to pass the expense of Vaad certification through to unwilling customers (making the food unmarketably expensive) or foregoing their desire to operate a kosher establishment. These are perhaps isolated stories, and there are undoubtedly other sides to those stories, but one must wonder whether a more open kosher certification regime would increase the number of kosher options available to the community and, ultimately, the level of kashrut observance. Kosher Michigan should really kasher a Middle-Eastern Bistro in Metro-Detroit. What about the Pita Cafe in Oak Park. So many jews go their already and they already serve hallal meat? The Antidote to a kosher monopoly lies in Kosher Michigan and Conservative Jews holding by their own hecksherim. R'Jason - There just are not enough Orthodox Jews out there. If the conservative rabbinate could convince their flock to frequent and hold by hecksherim if possible then there would be plenty of room for competition from conservative and orthodox heckerim in any city of any size. Thanks for bringing that to light. The politics in kosher certification are ridiculous. Wow great service for this renowned foods through truck.